Thoughts like those raced through my mind yesterday, two and a half hours into what would be nearly 4 hours in the saddle. I accomplished my longest ride of the season, covering 70 Kilometers. 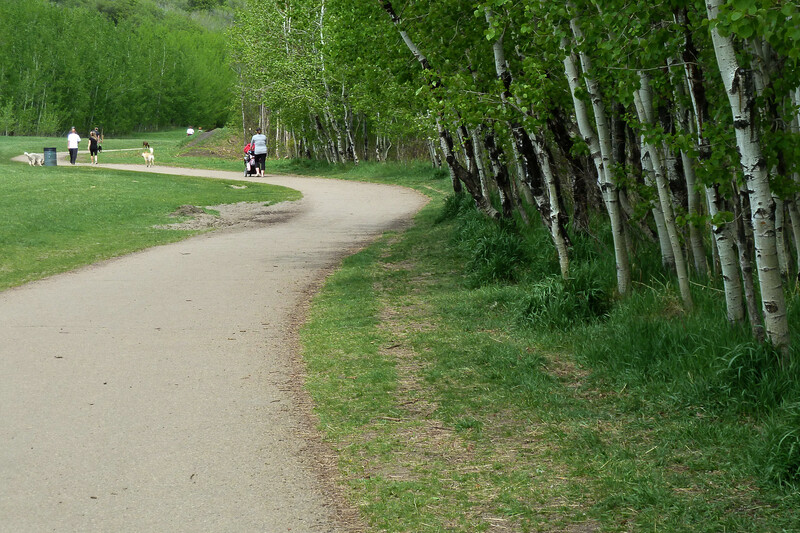 Again, I was able to rack up this distance riding mostly on the trails through the river valley in Edmonton. I may sometimes complain about the condition of the paths these days, but it sure is nice to have the pleasant scenery to cycle through and not to have to deal with motor vehicles. It was a cool May morning as I set out – about 8C degrees. Even though it was sunny, I did wear a jacket over my jersey and left it on for 3/4 of the ride. I also found that my legs (in shorts) were cool and my toes got a bit numb. I linked my 40K westbound route with my 30K eastern route to rack up the distance today. I started along the northside paths to to Groat Road. The long, flat section along River Road is a good way to warm up. 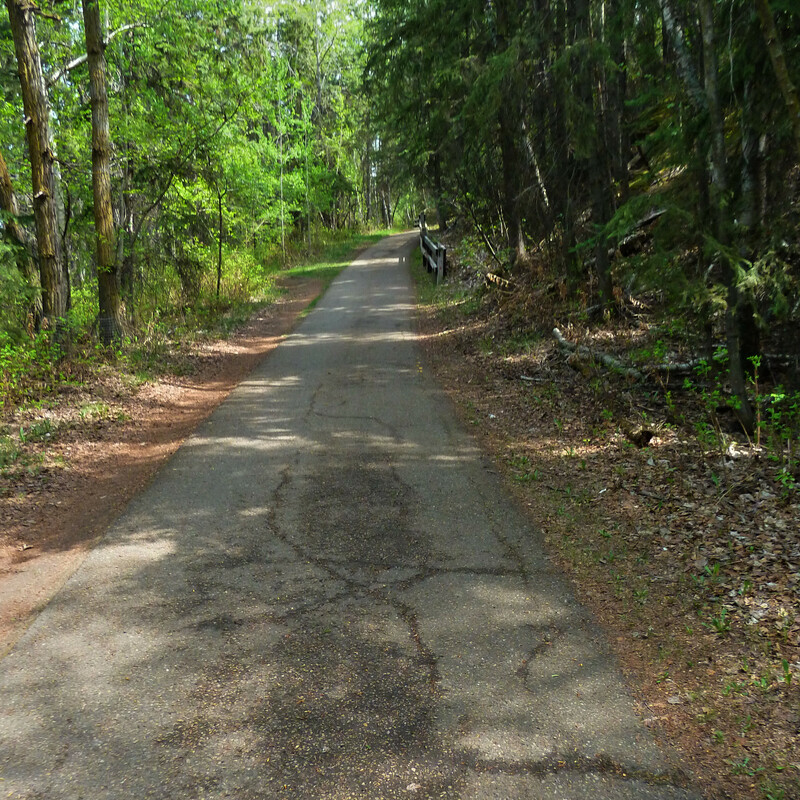 I hit my first climb out of the river valley at about 7K after crossing Groat Bridge and heading up Groat Road. 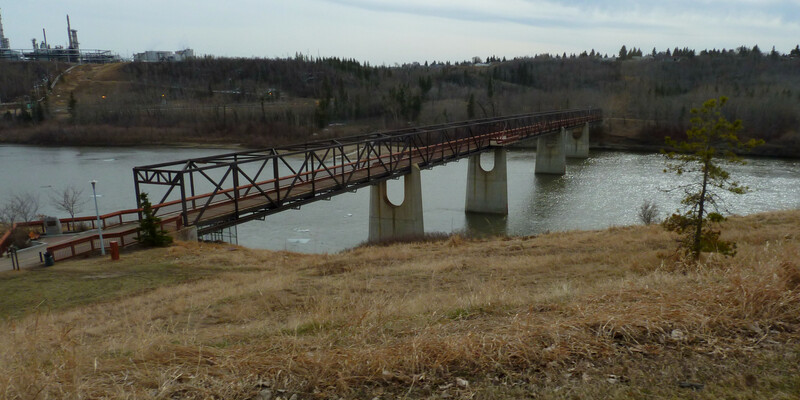 My route would give me a surprising amount of climbing – I ascended to the top of the river valley about 10 times. My GPS monitor indicated about 870 meters of elevation changes. 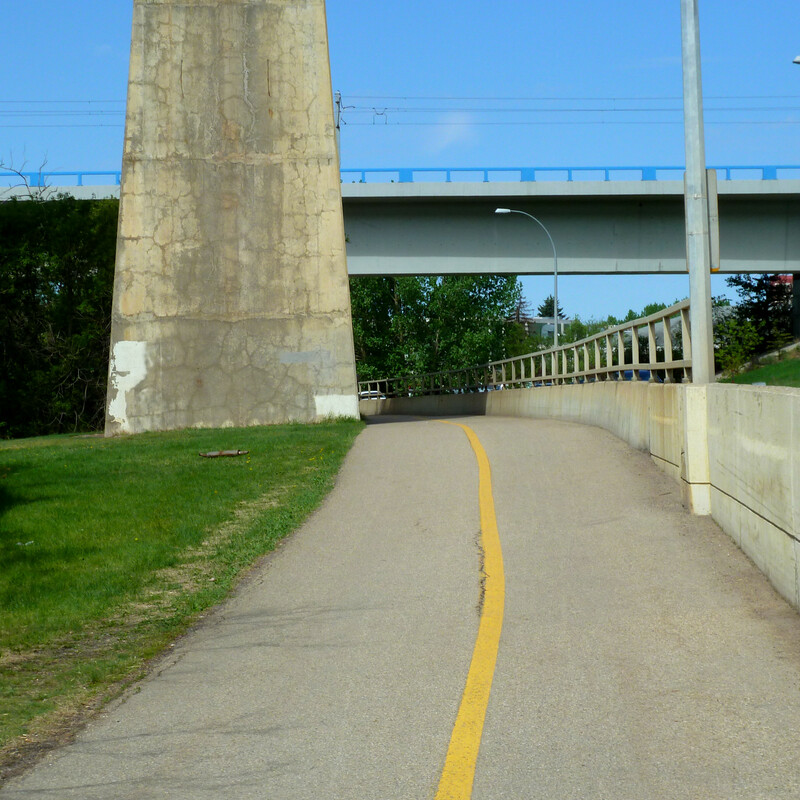 As the bike path crosses under the Quesnel Bridge [map]. 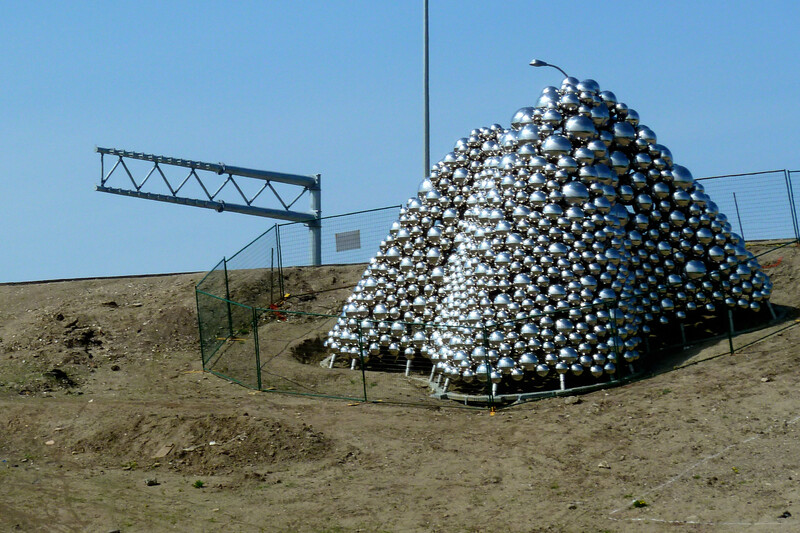 I see a fascinating but controversial public sculpture, the Talus Dome, at the south end of the bridge, on the east side. I very much like this one – maybe because it reminds me of ball bearings but the setting beside a freeway just doesn’t do it justice. Cyclists probably get a better view than do the motorists and I think it will look better once the landscaping at the base is complete. The ride proceeded uneventfully. I reached my turnaround point in Terwilligar at 20K and started by journey east which I would do along the south side of the river all the way to Rundle Park. This route involved 4 major climbs (i.e. to the top of the river bank) and a few smaller ones. By the time I got back to the downtown area, I’d covered 40K, just over half of my goal, in a couple of hours without any real rests. I was starting to feel a bit tired, a bit slower and getting hungry. I usually like to pack along an energy bar for times like this but I didn’t have any at home today. I figured I could pick up a snack along the way, but the downside of my route is that it doesn’t pass by any convenience store. I was looking forward to getting to Rundle Park where I know they have a snack bar/ concession. By the time I crossed into Rundle Park [map]. I’d covered over 50K and was certainly looking forward to a break. The park was looking particularly attractive. The lakes have been refilled with water and are in their reflective wonder. I made my way over to the pavilion but – the snack bar was closed! I looked around hoping to at least find a vending machine but one was not obvious, so I continued on my ride. I had another 20K to go, so figured I’d just have to do it on my built in energy reserves (5 or 10 Kilos of which I wouldn’t mind burning off). It was around now that those voices got loud. I found my self looking down at my tires to see if they look flat and wondering about all of the other mechanical reasons that might account for my slowing pace. Not that I was really fooled; I may have been tiring but still could reason that my low energy levels and muscle fatigue were the most likely culprits. I continued north from Rundle Park through Hermitage Park [map], amongst the dogs and up to the top of the riverbank at 20th Street, before heading back down on the 15K return trip. I did find my pace fell off noticeably over the last half of the ride but I still felt pretty good. Having been on the bike for so long, my neck got a little sore but that certainly reminded me of one of the areas that I am training – It is NOT all about the legs! I look back on that ride with pleasure, a sense of accomplishment. Now, in preparing for next month’s Silver Triangle, I just have to build up to cover a 50% greater distance in one day, then do it for three consecutive days and oh, do it in mountainous terrain. 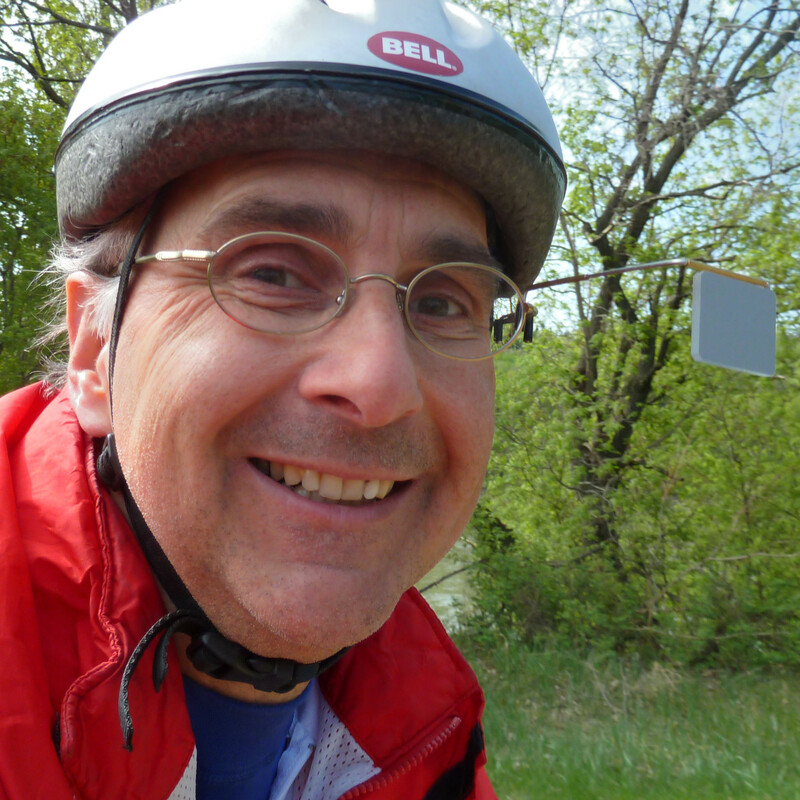 Today (2012 April 11) was serious ride number 4 (or is it five?) Well for sure it;’s the third ride on my touring bike and those in the last 5 days. Today’s ride was about 30 Km and took about an hour and a half. Thirty K represents a 50% increment over my last two rides and that is a bit bigger than I would like (to ensure I don’t push myself too hard too fast). Well, I don’t think there will be another 50 % increase in my single ride training distance and this one did go smoothly. 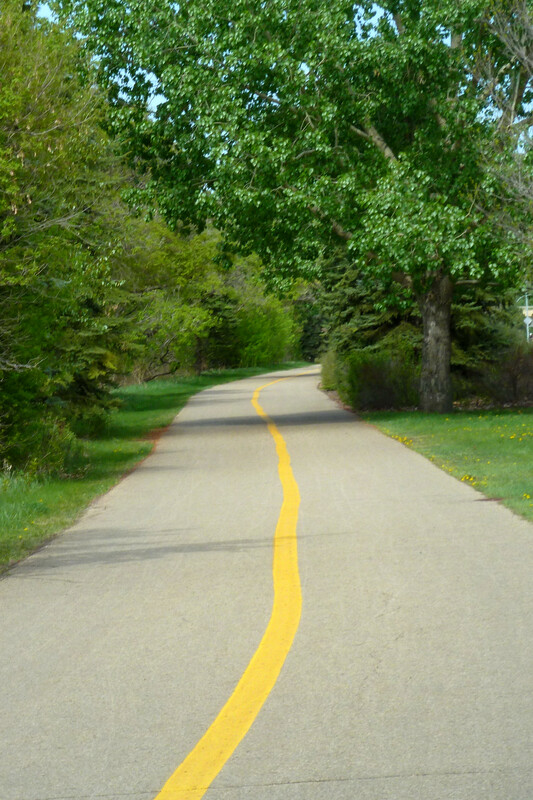 I did my typical Dawson Park to Rundle route but added an extra 5K (each way) riding north to Hermitage Park and back. This route provided me with five moderate climbs from the river valley floor to the top of the bank. Longer climbs would be good but I’ll settle for quantity (number of hills) over quality (length of climb) for now. It was a day of a few firsts. First of the firsts: with a temperature of +16C this afternoon I was able to ride comfortably in cycling shorts (instead of long pants). I did still wear a long-sleeve jersey but didn’t need a jacket today. The second welcome first was the first sighting of green grass along the side of the path – a sure sign that real spring is approaching. The third first (already mentioned) was achieving a 30 K distance. Hopefully this accomplishment will seem pretty trivial in a month, but for now I’ll take it as a milestone. Another first of sorts. Today was the first time this year I saw evidence of street cleaners cleaning off the winter sand from the roads. This was on Ada Boulevard and the cleaning seemed to miss the sand next to the curb so it is still necessary to ride a meter or two away from the curb to be safe. 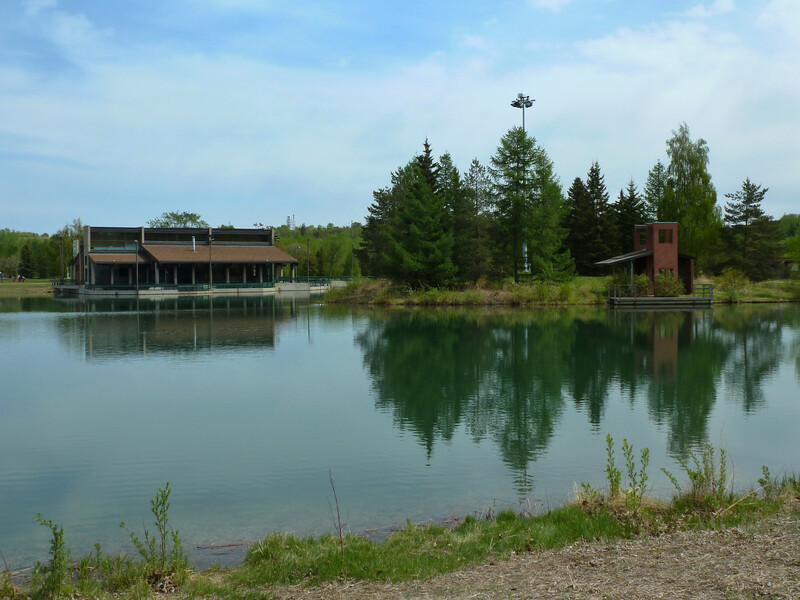 A couple of notes about animals on this route: First watch out for the Canada Geese. There are lots of them, often on or beside the bike path around the lakes in Rundle and Hermitage Parks. I had no problems with them but did sound my bell before passing a couple of pairs that were on the path. They are big birds and if they were startled they could get defensive and who knows where that could lead. As it was they seemed surprisingly oblivious to me as I rode by. The second animals to watch for are the dogs in Hermitage Park. The park included an off-leash dog area so there are lots of canines, of all sizes and shapes. I have never had any problems with the dogs here and fact I quite enjoy seeing them. A cyclist just has to recognize that the few kilometres here will be relatively slow as you must watch what the dogs (and their sometimes oblivious owners) are going to do. 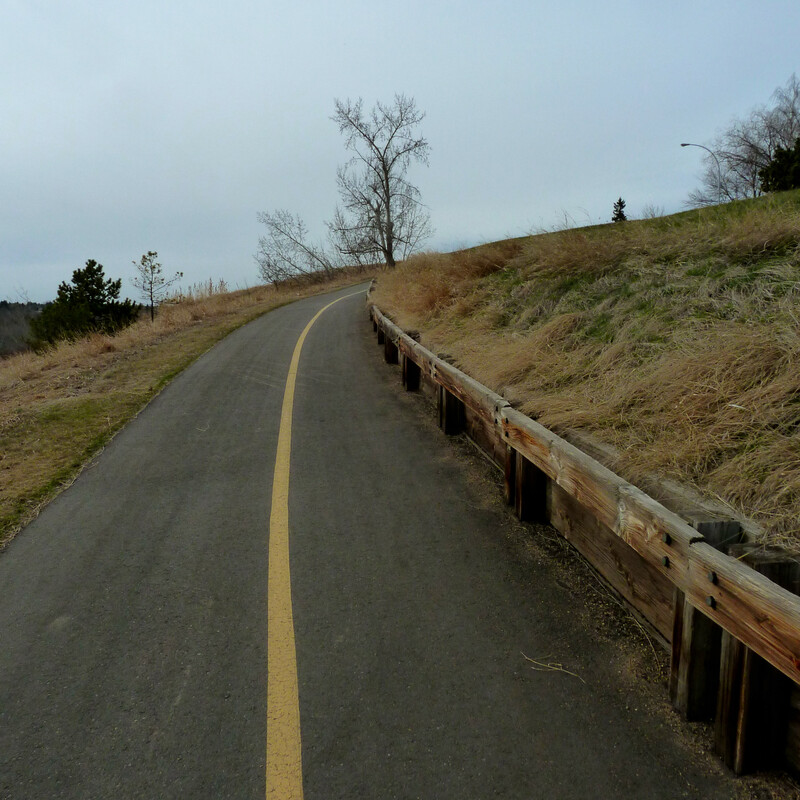 If you want to cruise through this area like you might on other bike paths – don’t! Do everyone a favor and turn around before getting to the off-leash area (about 1km north of the Beverly Bridge).